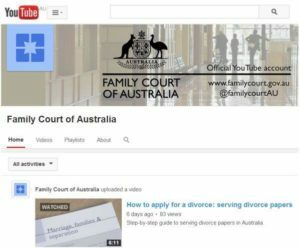 The Family Court of Australia and Federal Circuit Court of Australia have launched their official YouTube channels to provide informational videos aimed at helping self-represented litigants with court procedures relating to family law. Chief Executive Officer of the Family Court and Federal Circuit Court, Richard Foster said the courts received about 45,000 divorce applications a year and of those applications almost 70 per cent had no legal representation. Mr Foster said one aspect of the divorce process, serving documents, had been identified as an area which caused most confusion to some clients and was the subject of the first video. He said How to apply for a divorce: serving divorce papers was produced by the courts to help self-represented litigants understand and carry out the process of service in divorce applications. Mr Foster said this video was the first in a series of videos planned to provide court users with simple information in a digital format which differs from the usual printed fact sheet. “The courts aim to help clients through the legal system in what is often a difficult time in their lives,” he said. Mr Foster said this was a further step in the use of technology and social media as a means to make the court process more accessible and to better communicate with court users. The Family Court has been using Twitter (@FamilyCourtAU) since October 2012 and both courts actively encourage the use of the Commonwealth Courts Portal as a way to file and manage documents. Federal Circuit Court of Australia’s YouTube channel. For the Family Courts Twitter page, go to the following link. For the Commonwealth Court Portal, go to this link.